Psyonix is working hard to optimize its follow-up to Supersonic Acrobatic Rocket-Powered Battle Cars. Shacknews recently had a chance to check on the status of Rocket League, the unique mixture of racing and soccer. While the PlayStation 3 had its share of downloadable success stories, there were few as unlikely as Supersonic Acrobatic Rocket-Powered Battle Cars. This combination of gas-powered vehicles and the great sport of soccer was an unusual combination on the surface, but developer Psyonix made this crazy idea work, so much so that the game developed quite a following. That following appears to be following the developer to the game's spiritual successor, the much more simply-titled Rocket League for the PlayStation 4. Last week, Shacknews had the opportunity to check out the game's beta and get an idea of how it's coming along by looking a the game's interface and also by playing a few rounds with Psyonix. Rocket League's gameplay, both in terms of concept and controls, haven't changed much from the PS3 days. The idea is that teams are placed inside a massive arena to drive and bump a giant ball into their team's goal, making it a motorized soccer game, albeit one without a goalie. The game operates on real-world physics, so players need to account for speed, angle, and force when slamming into the ball. There are plenty of opportunities for trick shots, as players can drive up the curved walls and also flip their car backwards for bicycle kicks. Up to four players can join a team, allowing for game types of 1v1 through 4v4. Action plays out quickly and keeping up with it mostly involves keeping a finger on the camera trigger. The default camera will follow a third-person perspective, but a press of a button will move the camera to focus on the ball. This can make it easy to keep track of where it's moving, but it'll also make it more difficult to line up a shot or avoid smashing into friends. The key to successful striking is knowing when to balance the two camera angles. It's not easy, as I missed several open shots or miscalculated a strike that had the ball bonking off a corner. Most of Rocket League builds on the concepts set by Supersonic Acrobatic Rocket-Powered Battle Cars, but Psyonix has gone and added an array of new options and customization features. To start with, there are now up to ten car types available, with players able to select from buggies to 4x4 trucks. There is no different in stats, aside from an occasional tweak in hitboxes, allowing for the most balanced experience possible. The idea is to allow users to create their own unique vehicle. While paint jobs can't overly deviate from the default blue and orange team colors, there are many other customization options to choose from. 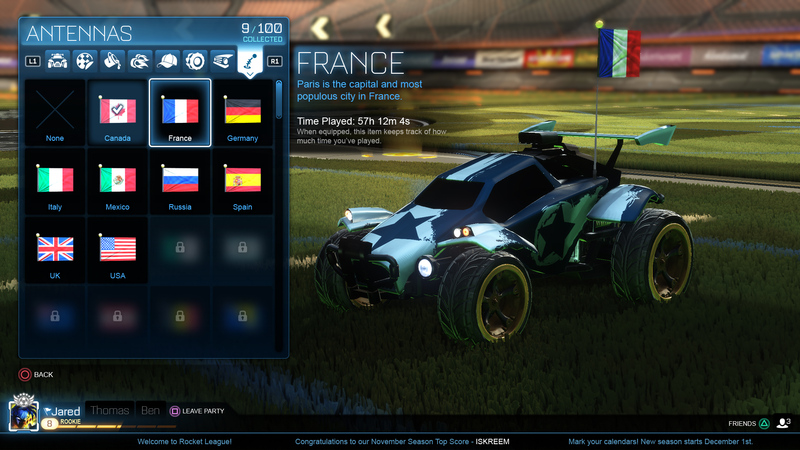 That includes decals (that can be painted any color), antennas, and toppers, which include flag options from the many soccer-loving nations slated to receive this game. Psyonix also took advantage of the PS4 hardware by improving the on-the-pitch product. Textures are brilliantly detailed, right down to each individual blades of grass. The visual improvements will also carry over to the game's arena options, where pitches like Mannfield Stormy will introduce rainy weather conditions. The game runs at a crisp 60fps, with no evident signs of slowdown or lag. Psyonix is also looking to bring that smoothness to the game's online modes, which offer a mixture of local options, as well. Friends can jump on for their own split-screen sessions or they can team up and jump online simultaneously as a unit. Rocket League is a very simple game to get into and looks to be a fun option for anyone looking to mix their racing and sports games together. Psyonix currently has the game in beta, as they are seeking to optimize the product as much as possible before launch. Once the game launches, the team is looking to add a slew of free updates that will introduce new arenas, a tournament mode, and a spectator mode. Paid DLC will be strictly limited to additional cosmetic options. 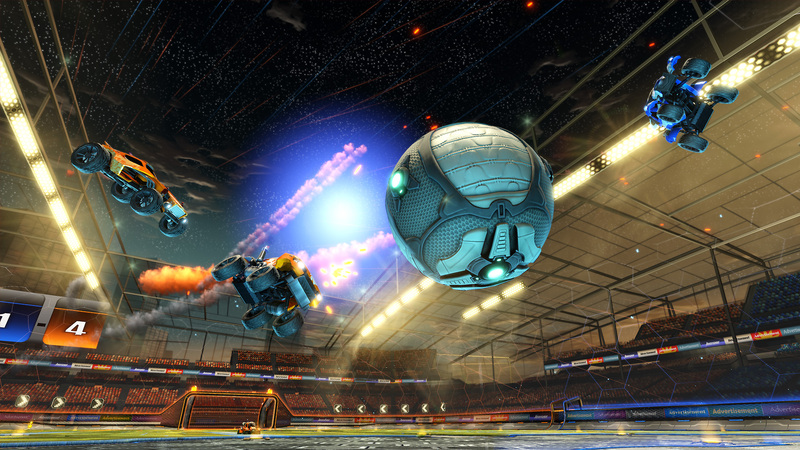 Rocket League is set to release in full this summer on PlayStation 4. Huge fan of the first one, so much fun, chaotic, but enough skills based to make it challenging and hilarious!